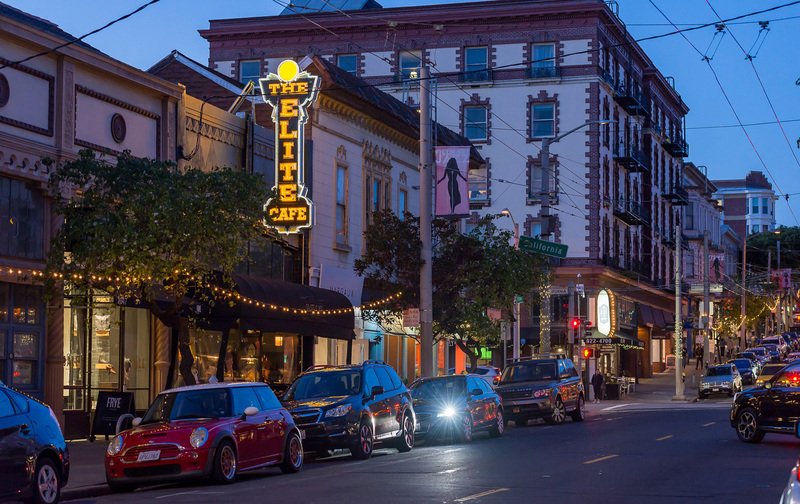 Long a Fillmore Street landmark, the historic Art Deco building housing the Elite Cafe has been bought by the two saloon and restaurant investors who own Harry’s Bar across the street, and the Elite will close on Easter Sunday, April 21, after a 38-year run. Rick Howard, who’s already an investor in the Elite, and his business partner, George Karas, say they pounced on the property when a 100-year-old family trust expired. Originally it was called the Lincoln Grill. 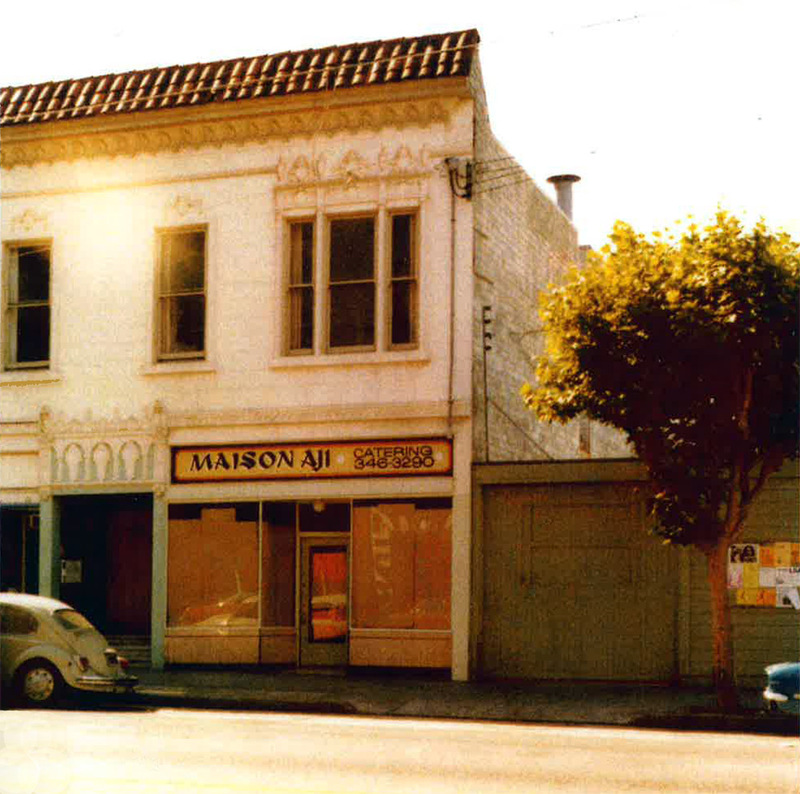 Later it was renamed the Asia Cafe and was a popular chop suey parlor until the SFPD vice squad busted the place for running a gambling operation in the basement. The tipoff: PacBell told the cops the Asia had 40 phone lines but no takeout service. 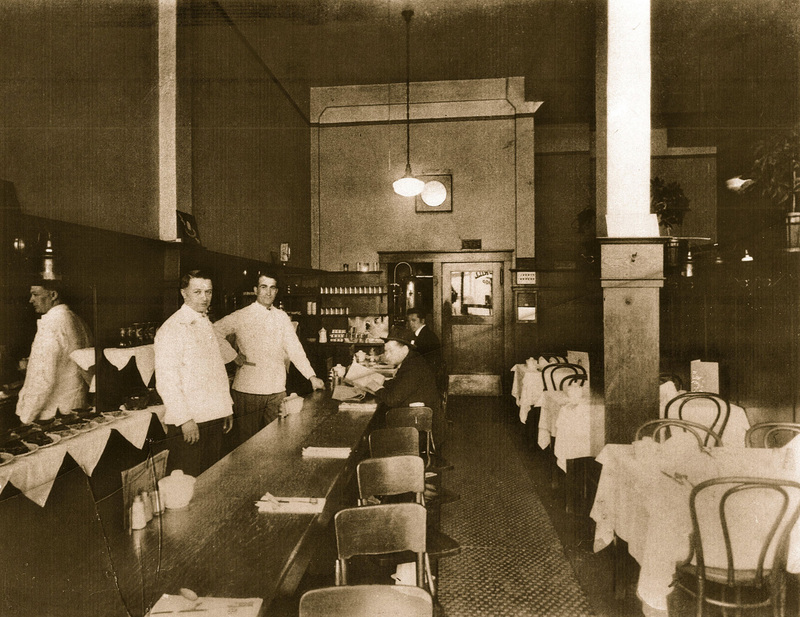 Originally it was called the Lincoln Grill, but until its final years it looked much the same. 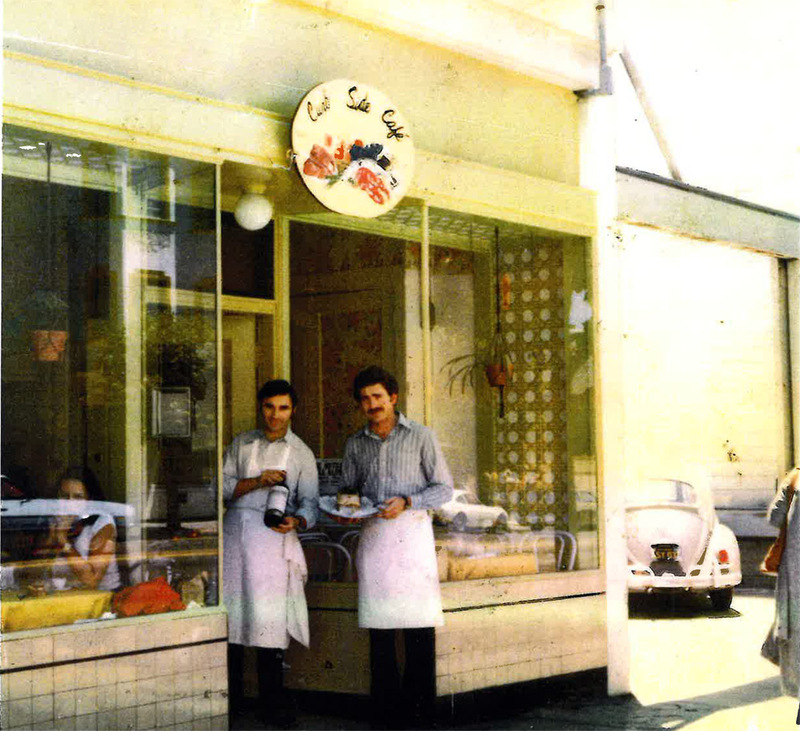 After being boarded up for a while, it was rescued in 1981 by Bay Area restaurant impresario Sam DuVal — who beat out Jeremiah Tower, later to open Stars — and reinvented the space as a New Orleans Cajun-style eatery, saloon and oyster bar that would be called the Elite Cafe. DuVal’s instincts were perfect. 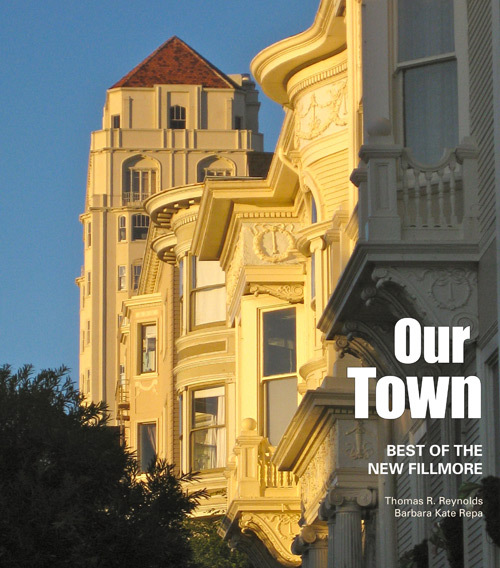 With a well-traveled, free-spending Pacific Heights crowd just north of him, the Elite took off like a shot — and, with the opening of Fillamento a block north, spurred the transformation of upper Fillmore into an increasingly upscale shopping and dining district. There have been three proprietors since Sam, including current owner Andy Chun, who made the place modern when he took over three years ago by ripping out many of the traditional furnishings and fixtures and painting the woodwork black and battleship gray. “They ruined it,” DuVal groused. The restaurant is on the market and two competing suitors, one a prominent Italian restaurateur, are said to be vying to take over. Chun said his lease required him to continue operating as the Elite Cafe, but there will be no such requirement this time. 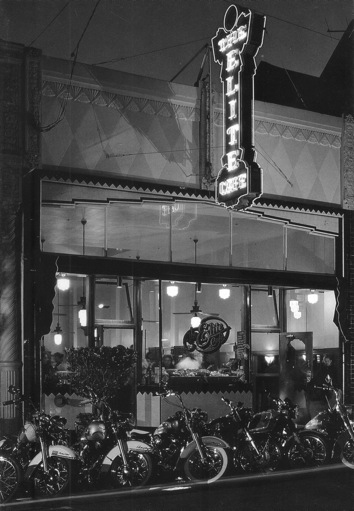 The Elite Cafe quickly became a hotspot after it opened in 1981. 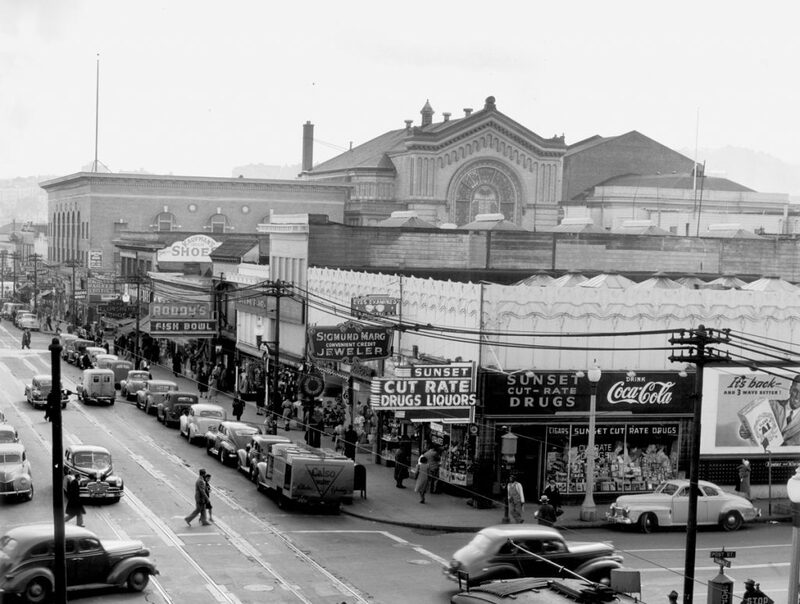 At rear, tops of the Fillmore Auditorium, Beth Israel temple and Masonic temple in 1946. Since 1904, the south side of Geary between Fillmore and Steiner has been graced with a series of temples: a fraternal temple, a temple of worship and a majestic temple of entertainment. It’s a tale of three buildings, two earthquakes and one dangerously zealous religious leader, along with many other characters and stories. Only one of the temples remains today. 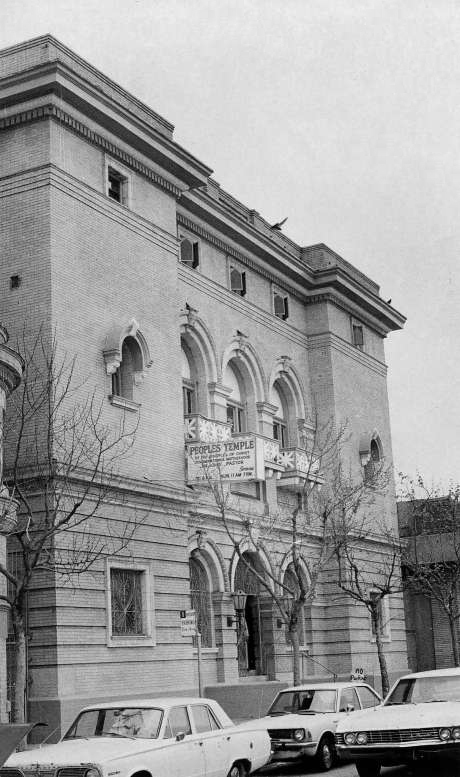 The Peoples Temple was located in a former Scottish Rite temple on Geary Boulevard where the post office now stands. 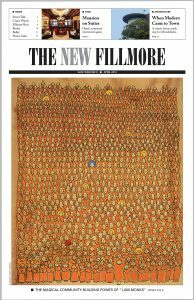 FORTY YEARS AGO this month, on November 18, 1978, 909 men, women and children — many of them members of the Peoples Temple from the Fillmore neighborhood — died in the jungle of South America after ingesting a mix of cynanide, sedatives and Flavor Aid fruit drink at the urging of their leader, Rev. Jim Jones. 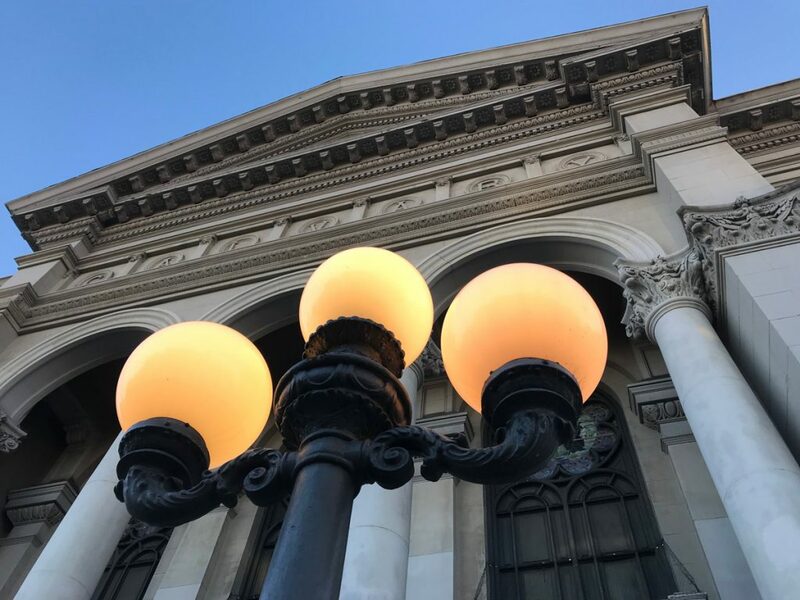 • On Wednesday, November 7, the California Historical Society will present a program featuring historians, academics and survivors at its headquarters at 678 Mission Street. “Discussing Peoples Temple: Understanding the Social, Cultural and Political Influences on the Peoples Temple Movement” starts at 6 p.m.
• On Sunday, November 18, a “Day of Atonement in the Fillmore” is planned, beginning at 1:45 in front of the U.S. Post Office on Geary near Fillmore, where the Peoples Temple once stood. It includes a march down Fillmore to the mini park between Turk and Golden Gate and numerous guest speakers. 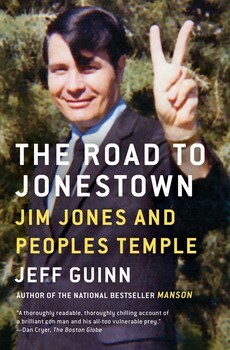 A LAUDED RECENT BOOK by journalist Jeff Guinn, The Road to Jonestown, aims to tell the definitive story of Jim Jones and Jonestown. 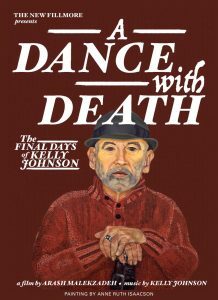 Guinn reports that Jones and his followers first came to the Fillmore in 1968 from their compound in Redwood Valley, up in Mendocino County, where they had earlier relocated from Indiana. About 150 of Jones’s followers came with him to San Francisco to attend the service, all entering the church on Sutter Street near Steiner together, a sea of white faces in a black church. Friendships were formed and visits exchanged. Jones was later invited to offer guest sermons at the church, which were widely advertised. Rev. Debra Low-Skinner is vicar of Christ Church Sei Ko Kai on Alta Plaza Park. 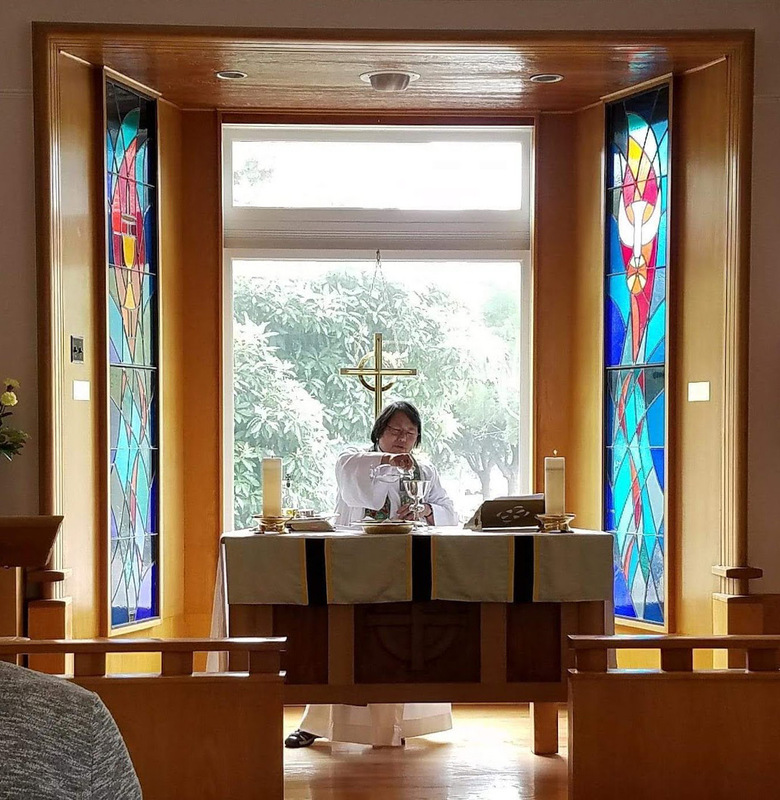 “Our congregation reflects San Francisco,” says Senior Warden Gordon Park-Li of historic Christ Episcopal Church Sei Ko Kai, which graces the corner of Pierce and Clay Streets across from Alta Plaza Park’s grand staircase. On any given Sunday, its small, warm sanctuary welcomes Japanese Americans, Chinese Americans and Americans of assorted other heritages. In a neighborhood where houses sell in the multiple millions, the stately Victorian home of Christ Church offers a unique link to the good and the bad of San Francisco’s past, as well as its constantly changing future. Treasures from the Brown Bag, the emporium and office supply store at 2000 Fillmore. Every time I walk past the corner of Fillmore and Pine, I am transported back to the Brown Bag, the stationery store that was a mainstay on the northeast corner for many years. 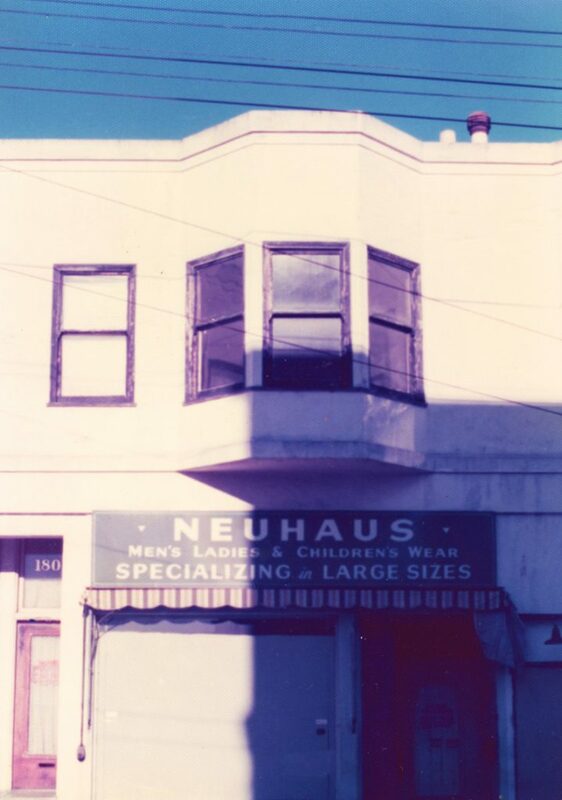 Back in the day, I owned a small business in North Beach, but was struggling. I met Dawn, one of Brown Bag’s owners, when I was helping out on weekends at the nearby California Street Creamery. We had become friendly, and when I decided to quit my store, Dawn offered me a job at the Brown Bag. I’d had ongoing connections with the Fillmore neighborhood since moving to San Francisco, so working at the Brown Bag seemed like a good fit. 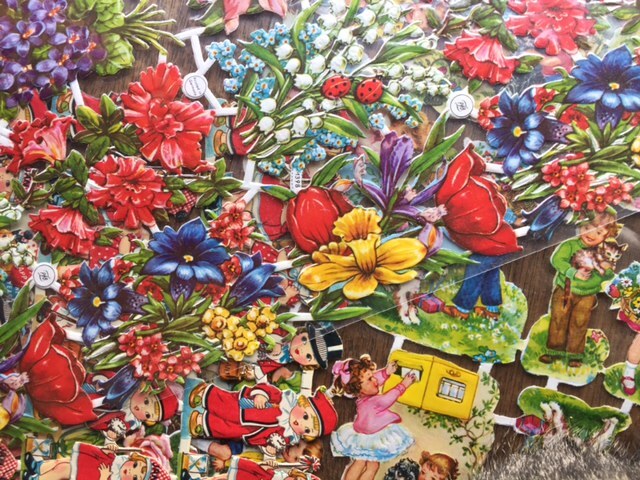 I loved its eclectic mix of practical supplies and wildly impractical baubles. It reminded me of the old-fashioned 5 & Dime in my Midwestern hometown. The place even included the smell of bacon wafting in from the Chestnut Cafe next door. Three old-style lamp posts on Fillmore are dedicated to Katie Flavel. But who was she? For nearly a century, three lamp posts on the sidewalk in front of Calvary Presbyterian Church have added enlightenment on the busy corner of Fillmore and Jackson. The two on either side have plaques attached dedicating them to the memory of Katie Flavel, who apparently died on August 19, 1910. But there is no record she was ever a member of Calvary. One of the flyers distributed during the fight for a 40-foot height limit. On a Friday in April of 1972, Charlotte Maeck got a purple postcard in the mail at her Pacific Heights residence that she initially thought was a hosiery advertisement from the I. Magnin department store. On closer look, she saw it was a city announcement of a hearing the following Tuesday on a proposal to rezone the areas between Van Ness to Steiner and Union to Washington to permit structures of up to 160 feet — or 16 stories. 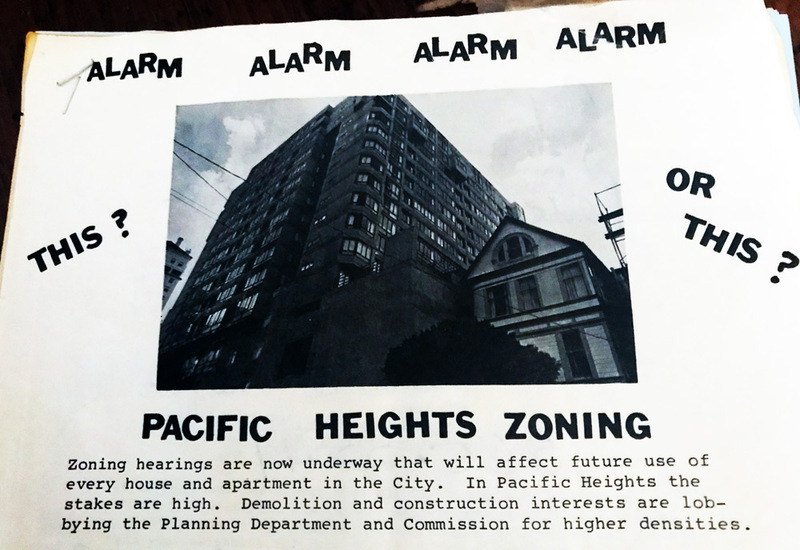 Before then, height limits of 65 feet and 105 feet existed in various parts of Pacific Heights. Maeck, who was busy raising her four children with her husband, orthopaedic surgeon Benjamin Maeck, in their home on Pacific Avenue, knew nothing about planning codes and had never been involved in the brawling political fights over development in San Francisco.